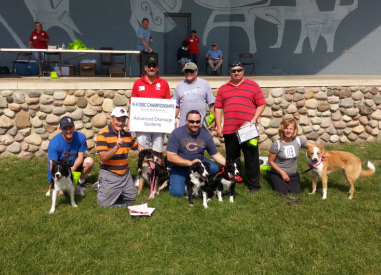 The 29th Annual Curwood Festival K-9 disc Championships took place this past Sunday and ironically 29 teams were competing for the State of Michigan Champion. The three and half hour event brought in hundreds of spectators and teams from not only Michigan, but also Indiana, Illinois, Ohio and as far away as Florida. In between rounds the crowds were treated to and participated in Agility performances by Dog Sports of Americas Classic K9 Show. Two championship titles were up for grabs and longtime competitor Bill Camp, with his Aussie Star, took overall honors with a 3 round score of 82.5! Following in second place was Jim Foley with his McNabb Rally @ 73.6 and in third was Bill Marion and his gal Pegasus with 71.7 points. Full results of the top ten can be found on the festival website. In the Distance Accuracy Only competition, the top three were separated by only one point each with Jim Foley and Flagg taking it with a two round total of 28 points. Close behind in second with 27 points was Chip Baker and Phate, followed by Bill Camp and Star with 26. See the website for the complete recap. The K-9 disc Championships held each year at Curwood Festival are not only entertaining and fun, but offer a unique equal playing field for competing teams by never charging an entry fee. This is because of our sponsors like Advanced Drainage Systems of Owosso who pick up the tab for everything. The 2015 Championships will be held June 6 and 7, 2015. Watch the festival website for full details. The Curwood Festival is a 501c.4 organization dedicated ”to celebrating the life of author/conservationist, James Oliver Curwood, by organizing, promoting, and conducting family events using the efforts and resources of volunteers, businesses, non-profit organizations and governmental units to enhance the economic and community image of Curwood Country.” For further information, please contact the Curwood office at 989-723-2161.